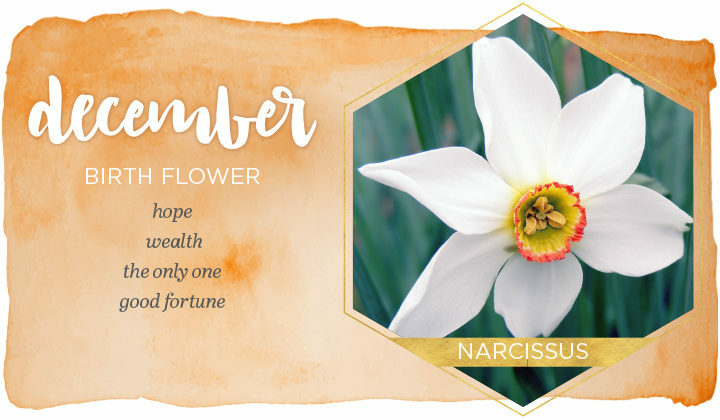 The narcissus flower’s name is derived from Greek mythology. Narcissus was a young hunter who was famed for his attractiveness. He was so attractive that he, himself, was obsessed by his good looks. One day, when looking at his own reflection in pond, he leaned in to take a closer look only to fall in and drown. Therefore, the narcissus is known for being a symbol of vanity in Western culture. It is a symbol of wealth and good fortune for the coming year. As a symbol of hope, the narcissus has become an emblem for cancer societies around the world.